Haven’t had much time lately between work, kids and my mission to find Lilly. I’m so behind! Thankfully, I work from home and I love what I do. Bad thing is I get distracted easily. I have an update about Lilly’s case. Lily’s mother and I paid a visit to Miami Dade Police Detective Aaron Mancha. We’ve been trying to talk to him to get an update but since he never returns our calls, we went to the police department. We wanted to know why Christen and the others who were in the apartment when Lily “left”, hadn’t been interviewed yet. His reply was that he had tried calling him but he hasn’t returned his calls. He also mentioned visiting his apartment a few times but he wasn’t home and so he left his business card with a note for Christen to call him. We persuaded him to try again. And he did. But again he wasn’t there. Another business card was left at his door. We took the opportunity to go to the neighborhood and talk to neighbors, gather information. We waited around and eventually got to see and visit with Christen. He provided more details about what was happening the night Lily disappeared and the people that were there in the apartment. He said that Lily left after a big argument they had. He said she was wearing pajamas and didn’t have shoes on or take any personal belongings with her. Lily’s mom and I spent a lot of time lately driving up and down the streets of Miami, Coconut Grove and Overtown searching for Lily. No one has seen her. 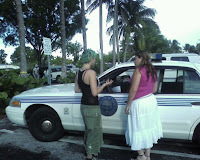 But we did find Kelly, (pictured above with Lucely, Lily’s mother) in Coconut Grove. Kelly went to school with Lily and was there that night. She had bruises on her face and body, which she said were thanks to Christen. We tried calling the investigator but can’t ever reach him and he doesn’t return our calls. I found out about another beautiful young lady by the name of Heather Riggio that is missing from North Miami Beach since May 2007. I haven’t seen her in the news either.